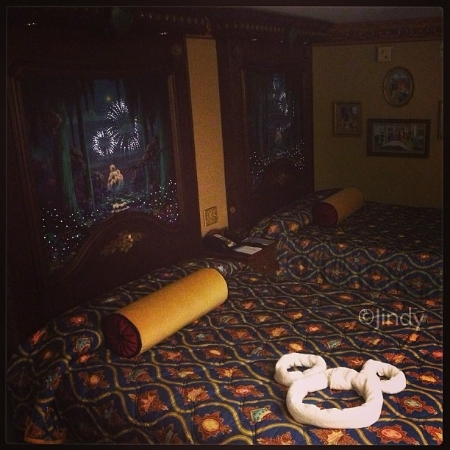 Behold: the beautiful Royal Suite I called my home and office for 4 lonely nights during the runDisney Goofy Challenge in January of this year. I kept pressing the buttons on the headboards to watch the fireworks while on the phone with my office in California. Although I was on a pre-planned and pre-approved vacation away from work, I learned the day I left that I would be required to work remotely the entire time I was at Disney World. When you take a Disney vacation, you never plan to spend the majority of your time in the room, and many families choose their accommodations based on that fact. I chose Port Orleans Riverside because I was familiar with it from our family vacation during Princess Half in 2012. There are not enough words to express how happy I was to have chosen to stay at POR again! The proximity from my room to the pool, the bus stops, the food court was perfect. The wifi in my room was outstanding. The service and the tranquil vibe of the resort - day and night - were just what I needed to power through 3 races, 39.3 miles of running, 99% humidity, a week's worth of sales reports and 4 hours of sleep. If you have the opportunity to visit at Walt Disney World, I highly recommend Port Orleans Riverside.